Of the bears found in America the black bear is the smallest with males weighing in between 125 and 500 pounds and females reaching about 300 pounds. 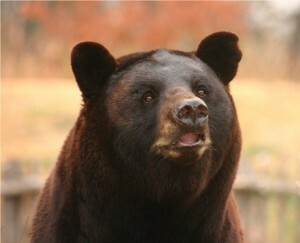 Black bears breed from May through July with a litter of two or three cubs born in January or February. The cubs only weigh about ½ to 1 pound at birth. They have the smallest young in relation to adult size of any placental mammal. Cubs stay with their mother for about a year and a half before the mother forces them away when she is ready to mate again. Range: Most of North America and Mexico in dense forest to open woodlands and brush lands. More than 90% of black bear deaths after the age of 18 months are the result of gunshots, trapping, motor vehicle accidents, or other interactions with humans.